Enough with these Olympics already. The cold. The “sports” like “slopestyle.” The vodka. It’s not too early to start thinking about the Summer Games. Which means Brazil. And rum. 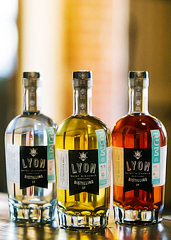 Here to help you stock up your 2016 stash: Lyon Distilling Company, which specializes in the stuff and is now officially open in the Eastern Shore hamlet of St. Michaels—right next to the local brewery, conveniently. You may have been out to these parts for a little boating, a little duck hunting. Or to pay a visit to the Cheneys and Rumsfelds. But now, it’s also home to Maryland’s first full-production distillery in decades. And one of only a few rum-centric distillers in America. The building was once a flour mill, but now it’s turning out a surprisingly sippable white rum, a seasonal bottling with a little caramelized sugar blended back in and a version aged in used bourbon barrels. Go ahead, taste them. Then ask if they’ll show you around, so you can eye the tiny pot stills, the barrels of organic molasses, maybe an experimental batch where they’re distilling a local beer. And in coming months, expect to see a rye and a limoncello. And... expect to taste a rye and a limoncello.